It’s not so long ago that beaches in the Caribbean were considered unhealthy and rather unpleasant and people went to considerable lengths to avoid them. In fact, for most of the Caribbean’s European history, the most important thing was the view. This was mainly for strategic reasons, of course, or possibly to see the ships in harbour, but with such fantastically beautiful islands, it’s worth remembering that there are some lovely hotels positioned away from the beach. The setting of Secret Bay, a tiny new resort in Dominica (an island that doesn’t have many beaches, in the traditional Caribbean sense anyway) is serendipitous. It has a heart-stoppingly pretty view from its eyrie-like hillside perch, looking across to the Cabrits, once a fortified promontory that was a vital link in the defensive chain for the country that happened to own it at the time-the islands each changed hands many times in the constant battles for empire in the 1700s. And it certainly would have been an interesting place to be on April 12, 1782, when it had a ringside view of one of the key naval battles of the age, the Battle of the Saintes. The conflict started early in the day, in the channel between Les Saintes, an island off Guadeloupe, and Dominica (in French, the battle known as la Bataille de la Dominique), but by afternoon, the ships had drifted into view. By all accounts, it was an appalling battle. On one French ship of 1,100 men, only three remained uninjured by the end of the day. At the heart of the eastern Caribbean, Dominica might have been a lynchpin of the influence in the area. In fact, it was anything but. The island is so mountainous and extraordinarily fertile that it was almost uncolonisable. From the mid 1600s, as the French and English struck out for settlements, Dominica was left unowned for a whole century, as the last refuge of the Caribs, the Amerindian people that gave the region its name (Amerindian faces are still visible on Dominica’s east coast, in the Kalinago Territory). Dominica is still relatively undeveloped, with small and charming hotels and much of its massive green interior is untouched. As in many of the eastern Carib-bean islands, the centuries of disputed ownership have left a tangled heri-tage. French Creole is still spoken in Dominica and St Lucia and the populations are primarily Catholic. Close by, Martinique and Guadeloupe are still French. And where the former British Caribbean islands have mostly taken their independence, Martin-ique and Guadeloupe have been embraced by la Métropole. The stan-dard of living there is the same as mainland France. Citroëns and Renaults zip along the autoroutes, there are hypermarchés and Yves St Laurent. Rumour has it that they fly in pre-prepared croissants. Of course, the reason behind the battles in the Caribbean was West Indian sugar. The trade was extremely lucrative (the money generated later became the springboard for the Ind-ustrial Revolution in Britain) and whole swathes of the islands were blanketed with cane. Nowadays, the Cap estate in northern St Lucia, a former sugar estate, has more modern cultivation-hotels, villas and a golf course. Its finest hotel is Cap Maison, set just above the sea, its roof terraces with a 180˚ view, covering Pigeon Island (the main fortification in the area) to one side and the island of Martinique on the other. The views are even more spectacular in the south of St Lucia, which is incredibly lush and fertile (interestingly, the tropical forest that we’ve learned to love used to be known as ‘green hell’). 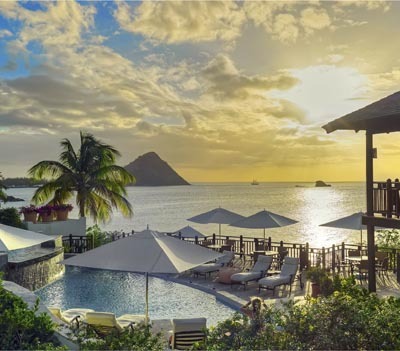 Between the twin peaks of the Pitons, the volcanic incisors that rise near-vertically from the sea, Sugar Beach, a Viceroy Resort, has recently reopened on the site of the old Jalousie Plantation. The suites, most set in their own cottages, sit right under the streaked rocky face of the Petit Piton. If the French did all they could to hold on to Martinique (and in 1763, they gave up their claims to Canada -‘just a few slopes of snow’-in order to keep it and thereby to maintain a foothold in the Caribbean), then the three vital strategic points for the British in the Caribbean were Jamaica, Barbados and Antigua. The last of these had a fortress on practically every headland and was incredibly heavily fortified. A quick look at the battlements and barracks on Shirley Heights above Nelson’s Dockyard and English Harbour is enough to explain why it was never attacked. It’s simply smothered in old Georgian military buildings. Now, it’s the scene of one of Antigua’s favourite parties-the weekly jamboree on Sunday afternoon. In place of drumrolls, easy reggae and soca reverberate across the hillsides now. The island continues its strategic role in one sense, as a key arrival point into the Caribbean from Britain, but, nowadays, we’re likely to contemplate the sea horizon more with unfocused pleasure than with any defensive purpose. The hillside suites at Hermitage Bay are ideal for this, lovely cottages built with tropical woods and with huge open windows to take in the best of the view. This carries to Montserrat and Redonda. One island further north here is Nevis, where they used to joke that communications were quicker in the late 18th century-when the navy could signal Antigua in seconds by mirror flash or coloured lanterns-than at any time up to about 1990, when the new telephone system was installed. It has some of the loveliest plant-ation-house hotels in the Caribbean. Historically, these were on the sugar estates, high on the hillsides. Now, of course, they have magnificent settings and superb views over the island and out to sea.